Hello, Hello and welcome back! I've got 2 cards to share as a reminder of the fabulous October Christmas Releases over at Our Daily Bread Designs! Come check out the lovely NEW Holiday sets HERE. For loads MORE Holiday Inspiration heck out the OBDB BLOG HERE, then be sure to stop by these ODBD's fabulous DT's Blogs! Simon Says Stamp Wednesday Challenge - Wrap It Up! card on top is beautiful America and the second card is so beautiful again. beautiful cards America! LOVE the second one's design! OMGoodness!! How awesome to make the soldier card!!! Perfect!! Love the 'gift' look of the second! Beautiful! WOW! Both creations are fabulous America! GREAT job! Thanks so much for joining us at The Sisterhood’s ‘DIE-LIRIOUS & PUNCHY’ challenge and please come back again soon! Two beautiful cards America! I love the red, white & blue ornaments! 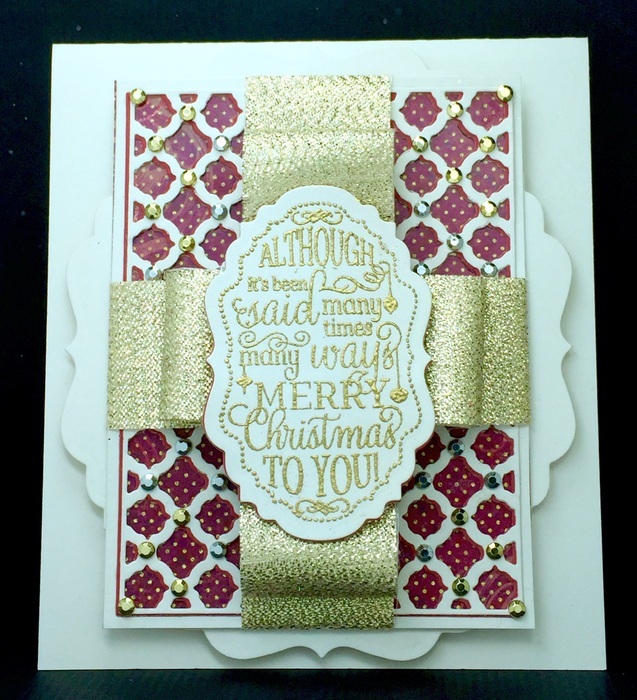 Stunning second card and fabulous gold ribbon! Thanks for joining us at Alphabet Challenge Blog! These are both wonderful, America! I adore your patriotic Christmas card & the second w/ the folded ribbon is so pretty. Lovely cards, thanks for sharing at Alphabet Challenge. Both cards are beautiful! 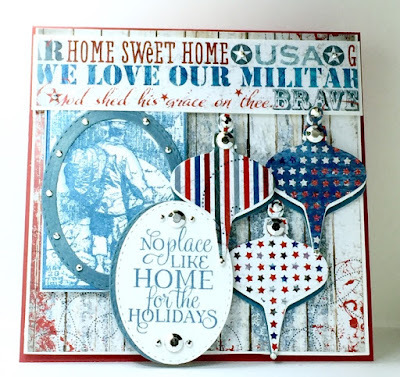 The first is very touching for our troops during the holidays and the second is elegant! Love the ribbon loops! Two gorgeous cards America! I love the pretty blue ornaments and the way you have used the gold ribbon to make your card look like a present is wonderful. Lovely cards. Thank you so much for entering our ATG challenge at Through The Craft Room Door this week. We are looking forward to seeing you again in the next challenge. Oh my word! America you have blown me away here! The patriotic card is amazing!!! Wowzer! That is incredible! Simply gorgeous! Thanks for joining us at LTSCB! Two great cards - thanks for joining us at Crafty Girls Creations.